Business Movie Review: Monsters, Inc. - Brilliant Breakthroughs, Inc.
Home › Business Strategies: Re-Discovering YOUR Business › Business Movie Review: Monsters, Inc.
Business Movie Review: Monsters, Inc.
We receive lessons in the most unique places. Believe it or not, the movies provide wonderful business lessons for us! I enjoy noticing lessons which share what to do, or what not to do, as I find both are of equal value! What can the movie, “Monsters, Inc.” (2001) teach us about business? 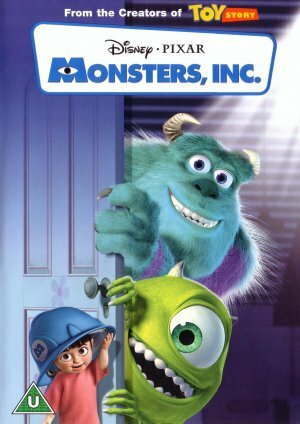 The main characters are on the side image: Sulley (the best scare-er in the land of Monster), Mike (Sulley’s sidekick cyclops), and a little 2 year old human girl, Boo. Monster’s Inc. is in need of creating more terrorizing screams of children, which power the town. The Board is breathing down the CEO’s neck and a competition is created for the top producers. Why/how? No way – not going to spoil it for you! The plot thickens quickly when the Monsters, Inc.’s building is contaminated, more than once… things heat up and lessons of business ethics are endless – to bad they weren’t necessarily applied! I really loved the opening scene of this movie: The viewer is placed right into the middle of an training/learning session. The CEO, Mr. Waternoose, is not satisfied with the progress of the rookie monsters’ training. The company has quotas to fulfill and the rookies aren’t looking so promising – (insert scream here)! Your turn: (1) Are you a good monster or just a monster with your paperwork? (2) Are you a good monster or just a monster because you don’t care enough about your customer service or performance outcomes? Expertise Tip: Always be practicing anything new before you impact others with a potentially poor performance. Just like in the movie, if you only had one opportunity to do everything, wouldn’t you make it “count”? LITTLE THINGS DO MATTER: Attention to details assists to assure success! Success can be assured in many ways: (1) Listening to “The Voice of Reason” can keep you from an “abominable nightmare”. (2) Always, yes always, have your entire staff seeking new ways to innovate the business’s activities and services. Your turn: (1) Are you a good monster or just a monster with your attention to detail? (2) Are you a good monster or just a monster because you don’t care, nor take the time, to focus on innovative ideas for your business’s success? Innovation Tip: If innovative ideas cannot be discussed openly, they may not serve the business well – keep searching! HONESTY IS THE BEST POLICY: Deceit and Deception just slow progress down! The deception amongst the company and it’s employees, as well as employees amongst themselves, was enough to slow down any business. Watch how much time, energy, and resources were spent in trying to cover up inadequate compliance to the company’s policies. Additionally, notice how little time was spent on producing versus the deception. Your turn: (1) Are you a good monster or just a monster with your focus and priorities? (2) Are you a good monster or just a monster because you spend too much time covering up inadequacies of yourself and/or others, which ultimately drop your production levels? (3) Are you able to speak up for what is right or do you spent time like a monster grumbling about what needs to change? Leadership Tip: If you are an owner of a business or a manager, always be asking yourself, “How can I keep everyone focused on the right things and doing the right things?” … happiness produces better results!